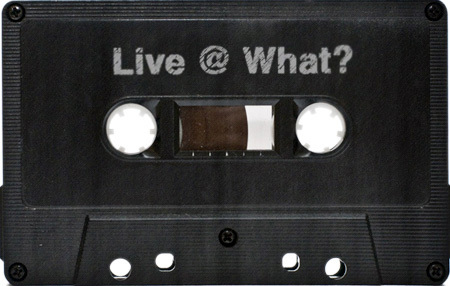 Various – Live At What? I’m not entirely certain of the various DJ’s for this Live @ What? mixed tape. My best guess is DJ Trance, Oscar Da Grouch and DJ Mellinfunk. Two of the mixes should be easily identifiable by The Beatles and Star Wars tracks. If anyone can positively ID who’s playing at what point on this mixed tape please post in the comments. Various – Live @ What? Wow, this goes back… The mixes on the first side from Perfect Love on to the end of the first side are me… must have been early in my start at What?because my live chops clearly need a bit of tightening up… lol. Some of these old mixes may not be the tightest, but they’re definitely a lot of fun to listen to. I have some good memories with this particular one. Thanks for the set ID on this. Holy crap! Anyone got a history lesson on who ran What? think it might be R.A.W and dj Trance. .
As far as the “Who ran What?” history lesson: the answer is Doug (now doing F.A.M.I.L.Y) and Chad. Sorry for the mis info….Pasqual was promoting Insomniac back then….. If I remember correctly, this night was with one of the NuMark mixers that had the built in sampler. So I think some of the sample cutting and dropping you’re hearing is that. Yeah totally could be. Haha I still have the MTX version of that mixer with the sampler. I think I posted it in my facebook pics. Does Anyone know whatever became of that DJ called Frankie love he played at WHAT many times.